Posted by Equestrian Australia on 18/11/2017. Equestrian Australia is deeply saddened by the passing of Gill Rolton (OAM). Gill, 61, showed her usual courage and waged a long and brave battle against endometrial cancer. She served as a devoted Equestrian Australia Board Member right up until the very end. Our deepest condolences to her family and many friends. A schoolteacher from Adelaide, Gill Rolton’s first goal in life was to talk her non-horsey parents into buying her a horse. At the tender age of ten she succeeded in doing that and so began a lifetime of passionate dedication to Equestrian sport. A Show and Dressage rider and coach until her early 20s, she began Eventing and Jumping at the age of 21 and started competing successfully at international level in 1984. She became the nation’s first female Equestrian Olympic medallist when she won gold at Barcelona in 1992 and Atlanta in 1996 as a member of the Australian Eventing team. 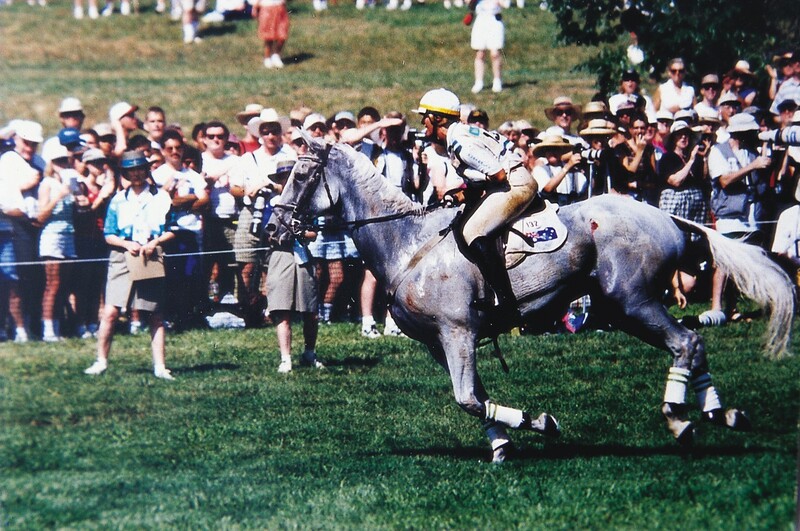 Gill achieved much notoriety at Atlanta after slipping on the flat at the half-way mark of the cross-country course and falling from her horse. She broke her collarbone and ribs but she soldiered on and remounted only to fall again at the next water jump. Miraculously, despite her injuries, she completed the 6000m course and posted a team score. This helped the Australian team of Andrew Hoy, Wendy Schaeffer and Phillip Dutton to win the prized gold medal. At both Olympics, she rode Peppermint Grove (Freddie), a horse she’d purchased as a gangly, barely broken in four-year-old. She brought him up through the grades to reach Olympic level. Whilst competing on some of the world’s biggest stages, Gill also worked her way through the EA National Coaching Pathway to become a level 3 Coach, Coach Educator/Assessor. She was a judge in both Showhorse and Dressage and made it through the EA National Officiating system and then onto the Federation Equestre International (FEI) officiating pathway for Eventing. Gill held various key administrative positions in Equestrian including EA Australian Eventing Team Selector, Chair of Equestrian SA, Chair of the SA Eventing Committee and Chair of the National Eventing Committee. She also spent four years on the Federation Equestre International (FEI) Eventing Committee. She served on the Equestrian Australia Board from May 9, 2013 until her passing. She had a strong vision for a truly national pathway for all facets of Equestrian and for the sport to become better appreciated by the general public, sponsors and TV viewing audiences. From 2001 to 2007 Gill initiated, co-ordinated and coached the Mitsubishi National Young Rider Squad to support talented young Eventing riders in their transition to senior level. This was a successful era for Young Eventing Riders in Australia with several squad members winning major events and making a successful transition to the senior ranks of the sport. That was also a period when the Australian Young Rider Eventing team was undefeated in Trans-Tasman Events. She also helped form what is now the highly successful National Interschools Program. Gill stood down as a National selector in 2007 to continue judging at FEI 4* Level. She was honoured to be one of the Eventing Ground Jury members at the London Olympic Games in 2012 and was President of the Ground Jury at the World Equestrian Games in Normandy in 2014. She was inducted into the Sport Australia Hall of Fame in 2002 and received an OAM for services to sport in 1992. She also recently received her home town of Adelaide’s highest honour and was handed the keys to the city. Gill Rolton was an inspiration and role model to many sportsmen and women throughout the world and she leaves a huge legacy in Equestrian sport through her enormous contribution as a rider and administrator. “Gill will always be remembered for her dedication and interest in young event riders, her service to the sport and her grit and determination to provide a foundation for Adelaide which would see its continued growth for many generations of riders to come,” said Fasher. Gill Rolton OAM's State Funeral has been confirmed by the South Australia Department of the Premier and Cabinet for Monday 27 November 2017 at 1pm, at Victoria Park / Pakapakanthi, Adelaide. Family, friends, colleagues and members of the public are respectfully welcome to attend. For those of you who would like to attend, please find further information on the link below.